Poetry by Heart is a recitation competition which launches in British schools this month. The competition, funded in part by the Department for Education and run by The Poetry Archive, is the UK equivalent of Poetry Out Loud, the US’s national recitation competition and requires entrants to memorise two poems: one pre- and one post-1914. Critics of the competition will find plenty to dislike here: poetry recitations are an annual event in many prep schools and, for some, this will look like central government aligning British education with the values and practises of the independent sector and of a bygone era; of the 130 or so poems in the anthology, many were written by canonical figures like Chaucer, Shakespeare and Milton, which, some would argue, have nothing to say to students living in a multicultural society; giving half of the anthology to the twentieth and twenty-first centuries gives them undue weight; the judging criteria, with marks awarded for physical presence, voice and articulation, dramatic appropriateness, level of difficulty, evidence of understanding, overall performance and accuracy, turn poetry, a fugitive thing, into a tawdry performance like Strictly Come Dancing; the website’s presentation, biographies and prompt questions makes the anthology look like the pre-digested literature doled out by examination boards; being asked to learn a poem off by heart and to suffer the horror of public performance will be enough to put droves of students off poetry for life. However, the anthology is an interesting beast and even the pre-1914 section avoids the usual list of dead white men with the inclusion of poems by Katherine Philips, Anne Finch, Charlotte Smith, W.E.B. DuBois and Paul Dunbar. The poems themselves are superb and, looking at the list, I quite fancy learning Keats’ Ode to a Nightingale and Arnold’s Dover Beach just for the pleasure of it. The post-1914 section is bang up-to-date with poems by Paul Farley and Jacob Polley, for example. This move has been criticized by detractors because no-one should be forced to carry the work of poets yet to stand the test of time around in their heads and into their dotage. This is a fair point and one detects Motion fearing that a larger pre-1914 section would signal to a new generation of readers that today’s poetry is all washed up. This second half of the anthology looks like an appeal to the new generation to give poetry being written now a chance. I think that this was the wrong move: the likes of Shakespeare and Keats are being read today for a reason. Michael Gove said that ‘To know a poem by heart is to own a great work of art forever. 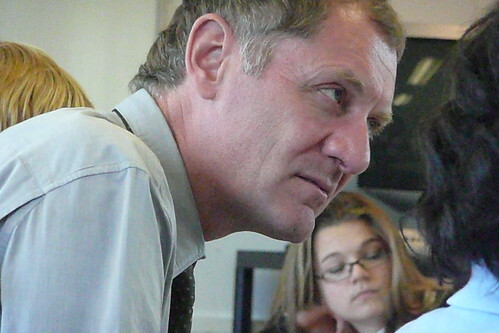 Andrew Motion is a hero for ensuring more children than ever will carry poetry with them all their lives’. If I had the choice of owning a couple of works of art, knowing that I had to live with them forever, I would prefer to live with Raphael, Caravaggio and Goya than Emin, Hirst and Whiteread purely because they withstand repeat viewings better. My own head is filled with Shakespeare, mainly because the pre-2000 A level allowed few texts into the examination room, meaning that my generation knew their King Lear and As You Like It better than anything, even if they later studied English literature as undergraduates. Living with King Lear for the best part of twenty years has continued to bear fruit. Do all the poems in the anthology promise such a dividend to the students who graft to learn them? Nevertheless, I think that Motion is right. The school curriculum and, within this, the English curriculum, is rammed to the gunwales with content, which means that teachers have to zip through poems, delivering their exegeses with authority and finality and the beleaguered students, knowing what’s good for them, learn this for their examination, or regurgitate it in their coursework. Asking students to learn the material is subversive. It sneaks it under the wire in the dead of night and, as a poet, Motion knows that once the words are lodged in the fertile earth of the mind, they will take root and grow. Motion said that ‘Poetry by Heart is the best thing that’s happened for poetry in schools for a long time: a way for pupils to have serious fun while they extend their reading, deepen their powers of appreciation, and memorize beautiful and intriguing poems which will enrich their lives for ever’. He’s right. All that schools have given to poetry, and to students aged between 14 and 18, for the last umpteen years is a wearying list of the same old names and an unrelenting diet of examinations and assessments. Poetry by Heart is a brave start and I look forward to seeing it take root deeply enough to resist the attempts at weeding that a change of government inevitably brings. memorization is crucial for the continued flourishing of poetry in the blood and it can be an act of beauty, not drudgery! Sadly, I’ve never found memorizing anything to be a beautiful experience: blood sweat and tears more like! Even things I teach year after year, or say or read day after day, don’t stick… even song lyrics. However, I agree, once it’s in the blood, it flourishes. I’m not sure that my teenage self would have seen the payoff as worth it though. My teenage self would not have enjoyed this one bit (at least at first) – for me now, it sounds like something a lot more enjoyable. On the selection, I haven’t seen it, but can you ever get every bit of a literature in 130 poems? I like the idea of including really contemporary poems – some of the criticisms of that sound like worries that the kids only have a finite amount of memory. If you can learn two poems, learning a third is easier. If you fancy a look at the anthology, the whole thing’s available as a flashy website. Just Google Poetry by Heart and you’ll find it (there’s a hyperlink in the first paragraph of this post as well). I know what you mean about a third poem being easier to learn after learning two, but my worry is that, if most participating teenagers only learn two poems, then shouldn’t they learn material that has withstood the test of time, rather than simply learning something because it’s the other side of an arbitrary post-1914 divide? The more I think about this, the greater the urge to learn some Keats. But then nappy changing and baby baths beckon! Many of these strategies encourage students to look at the form and language of poem. Taking anything apart is a good way to see how it works. It’s a shame that this page was posted under Teaching Resources, as the students will be the ones learning the poems but, in my experience, they tend not to click on areas of websites effectively labelled ‘Do Not Touch’. This is something I can’t make my mind up about. As a teenager I took great delight in memorizing poetry and Shakespeare plays. We were not required to do this in my comprehensive school; I just enjoyed doing it. Bits have lodged; much I have forgotten apart from the rhythms. Recently I decided to try to learn The Wasteland by heart and found it nigh on impossible. I’m not sure if this is age-related or just that it is harder without a strong rhythm eg a ballad rhythm, to keep me focused. I find free verse often defeats me for this reason. Some brains just seem to be wired better for this sort of learning. Those that can’t may well be turned off or just feel they are stupid but there will be some for whom it will be a joy. Start it in the Primary though, by Secondary I suspect it will be too late to train them. I’ve taken another look at the Poetry by Heart website in light of this comment. Of course you’re right – some poems are easier to learn than others: repetition, rhythm and rhyme will all be factors here. The rules for judging the competition state that between 1 and 6 marks will be awarded for the difficulty of the poem (http://www.poetrybyheart.org.uk/?page_id=46). These difficulty scores are not mentioned in the anthology and this will problematise some students’ selection process. On the face of it, Blake’s Auguries of Innocence appears to be more difficult than some of the shorter poems just because it’s longer. Judges are also likely to disagree about scoring the difficulty of the poems. All of Hamlet’s soliloquies! I’m impressed. It’s interesting that this initiative targets 14 to 18 year olds first. I agree with you, this sort of thing should be a natural extension of the good work started in primary school. It would be helpful if the anthology was clearly labelled to allow less experienced readers to spot the poems which are likely to be easier to learn. Some of the contemporary contributions to the anthology look like an absolute nightmare to learn and I can’t imagine anyone finding much pleasure in the process, whereas mastering the harmony and symmetry of something more formal in construction ought to be more rewarding. Yes, I agree – a chunk of Gawain has been included… in middle English! This in itself is a good thing – young people will be flicking through the anthology and will discover these gems for themselves, as if by accident. Whether anyone learns them or not is immaterial.